The biggest takeaway here is that you have to control what you can control. There’s no ifs, ands or buts about it. If that is what Kapler finds to be the most important, then he needs to practice what he preaches. Here is what I think he can do to truly find value at the margins for a team who’s offense went ice cold in the heat of a pennant race. It’s simple really – the lineup needs to be shaken up even more. Kapler went in to Tuesday night’s game with a different lineup than ever before. Here was the batting order: Cesar Hernandez, Nick Williams, Asdrubal Cabrera, Rhys Hoskins, Carlos Santana, Maikel Franco, Odubel Herrera, Jorge Alfaro, Nick Pivetta. I love that he decided to shake it up and put Hoskins at clean-up and move Santana down the lineup. I don’t think Williams is a good number two hitter, but Cabrera in the three-hole is a good look on paper. • 2B Cesar Hernandez – Hernandez is slashing .261/.371/.370/.741. While those aren’t eye-popping numbers by any means, he is the best leadoff man they have. I’d like to see him run a little more when he gets on first base to try to put some pressure on opposing defenses. He’s the mainstay leadoff man for the time being. • LF Rhys Hoskins – Rhys is the best hitter on the team and I’ve come to love him in the two-spot. If you want to maximize his at-bats plugging him here is the best move. For posterity, here’s Rhys’ slash line: .253/.365/.499/.864, 23 homeruns, 73 RBIs. • 3B Maikel Franco – Franco has been one of the best hitters on the team for the last 45 games or so. Hitting in the three-hole is good for his ability to hit for average and power. He’s slashing .277/.319/.477/.796, 19 homeruns, 58 RBIs. • 1B Justin Bour – The first “real” shakeup is sitting Carlos Santana in favor of the towering former Marlin. This isn’t too much of a slight on Santana but more of a desire to see if Bour can kick-start this offense. He’s slashing .229/.350/.413/.763, 19 homeruns, 54 RBIs. His at-bat against Craig Kimbrel on Tuesday night combined with wanting to see him get consistent at-bats at Citizen’s Bank Park are what makes me want to see him get a start. • C Wilson Ramos – The second shakeup. Frankly, I’m sick of seeing Alfaro struggle and it looks like he’s back from his rehab assignment. Wilson Ramos could join Phillies tomorrow. 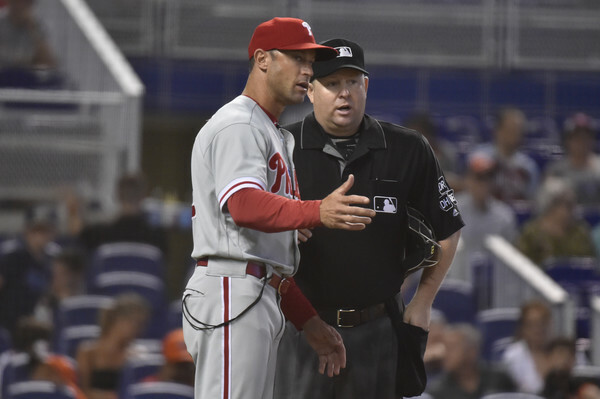 “Nothing is off the table,” Gabe Kapler said. Ramos reported to be feeling good after three rehab games. In his last start he went 3 for 4 with three doubles. The Buffalo is slashing .297/.346/.488/.834, 14 homeruns, 53 RBIs. He brings an offense to catching that Alfaro and Andrew Knapp simply aren’t bringing. • RF Nick Williams – Williams has been one of the Phillies “hot bats” lately. He could benefit from having more offense around him. The right field spot is his to lose however he could be moved up and down the lineup at will. • CF Roman Quinn – The third “shakeup”. If we’re being honest – I don’t know which sect of Phillies fans are worse, the people who irrationally hate Odubel Herrera or the people who irrationally love Odubel Herrera. Both groups are equally annoying and there needs to be more gray area. I believe there is a good baseball player in Herrera, he just makes boneheaded decisions like swinging at a ball that hit him in his back foot. Your eyes aren’t deceiving you. It’s time Roman Quinn gets another look in center field. He’s a good defender and can get on base. Once on base his speed is lethal – I’d like to see what he could do with an extended look. • SS Scott Kingery – I know, Kingery is batting terribly right now. I know his slash line is abysmal: .223/.266/.321/.586. I know he’s struck out 100 times compared to 21 walks. On the bright side, his defense is better than Cabrera’s and he’s more of a weapon on the base path if he gets on base. This move is double-sided. I’m over Cabrera right now after striking out swinging on Tuesday night he jogged down the first baseline when the Phillies had a chance to steal the game. In my opinion – that’s value at the margins. If Cabrera hustles down the line the Phillies have runners on the corners with RHYS HOSKINS coming up to the plate. Considering the team goes as Rhys goes, don’t you think Rhys finds a way to either 1.) Knock in the tying run, 2.) Walk-off homer or 3.) Walk and bring Santana to the plate. I like his odds there. I don’t wanna Alvin Kamara this situation, but this is a scenario Phillies fans were robbed of. I’m not saying Cabrera phoned it in, I’m just reporting what it looked like from my vantage point. Give Kingery the next start and see what the kid can do. • P Vince Velasquez – If we’re being honest, he could bat 8th and Kingery can bat 9th. It doesn’t really matter. If Kapler truly believes in finding value at the margins he should shake up the lineup. The bench is deeper than it’s ever been and it’s time to see what they have when the starters aren’t getting the job done. Iron sharpens iron, Kap. Make the switches and try to keep pace in the East – maybe it’ll wake up the starters and get this team ready for competitive September baseball. The season isn’t lost yet. PiLive: Eagles headlines and TMZ in Philly?